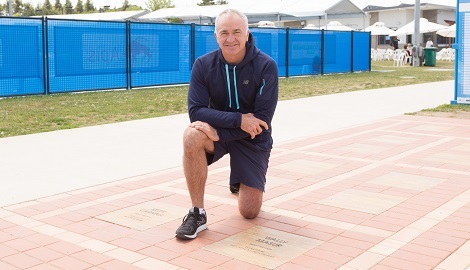 The Tennis ACT Walk of Fame is located at the entrance of the redeveloped Canberra Tennis Centre. The landmark honours those whose exceptional contribution has brought recognition and esteem to them and to tennis in the Australian Capital Territory. Commemoration is by way of signage and large sandstone inscribed pavers, surrounded by landscaped gardens and clay pavers donated by tennis commuity members. Designed by a local architect, the tennis court style display allows the project to extend along the entrance walkway, with an expected lifespan of up to 50 years. Framed artwork is also displayed within Tennis ACT. Inductees are announced annually at the Tennis ACT Awards. The tennis community can become part of the Tennis ACT Walk of Fame by donating a paver. Pavers are inscribed with individual or family names to recognise donations and are placed around the larger inductee pavers. For further information about making a donation, please click here. Selection is based upon, but not limited to, outstanding player record, coaching achievement, volunteer service to tennis and/or other exceptionally noteworthy accomplishments. Consideration is given to the individual’s contribution to tennis in the ACT and nearby NSW over a substantial period of time. Nominations may include coaches, volunteers, players, umpires and others who have made outstanding contributions to tennis in the ACT. Nominees must have been residents of the ACT or nearby NSW at or before their selection for a period of not less than 5 years. Nominees need not be a resident of the ACT or nearby NSW at the time of their nomination but must have been a resident at the time of the activities upon which their nomination is based. Nominations can cover any period since the origins of tennis in Canberra and its surrounds. Nomination forms must be received by the end of February each year. If they are received after that date, they will automatically go to the next year’s consideration. Nominations will stay on file for five years for re-consideration each year. Nominations may be made by any member of Tennis ACT and should address the specified nomination criteria and be submitted to [email protected]. A letter acknowledging the Nomination will be sent to the Nominator. Evidence of outstanding player record could include achievements at local, interstate, national and international events either as an individual or part of a team. Quality of opponents and status of the event may be factors taken into account in assessing the merit of any nomination. Any awards or recognition of achievement may be taken into consideration as demonstration of recognition and esteem. Coaching achievement may take into consideration not only the development of players who achieve outstanding results in tournaments at junior and senior level but also their general contribution to introduction of participants in their coaching programs to Tennis ACT activities and tournaments as well as their personal contribution to the advancement of tennis in the ACT. For volunteers and others, nominations should provide evidence of service to tennis in the ACT and/or nearby NSW that has contributed to the development and advancement of the sport. This may include participation in high level committees, officiating at major events or undertaking specific tasks of particular significance. Long periods of service at a local club would not necessarily demonstrate the qualities for successful nomination to the Walk of Fame. Existing and future life members of Tennis ACT are eligible to be nominated for the Walk of Fame. Such nominations will be assessed in the same manner as other nominations. The Board of Directors has appointed a Nominations Committee to examine nominations and to make recommendations to the Board. The Board may nominate individuals to be assessed by the Committee in addition to any nominations made by members of Tennis ACT.